A driver brings me to a wine warehouse in downtown Bordeaux. I am here not to purchase wine, however, but to meet with Christophe Tissinier, a colleague and friend whose company Bordeaux Excellence specializes in cruise operations and other tourism services. In fact, Bordeaux is much more than wine, particularly for river cruisers, something I discovered in April of last year on AmaWaterways. When I think back to that trip, I think of bicycles and bountiful vineyards. I think of sweet (and dry) white wines and bold and earthy reds. I think of uncorked bottles and the scent of crushed grapes fermented to perfection and basking in world acclaim. Bordeaux has been a center for wine trade for nearly 2,000 years. The Romans, who conquered the region in 60 BC, endowed Bordeaux with vineyards and wine production. Today, more than 10,000 wine-producing châteaux and 13,000 grape growers produce more than 50 appellations, many of which are world-renown and some of which are among the world’s most expensive wines. A fact that may astonish oenophiles: The Bordeaux region produces nearly 1 billion bottles of wine annually. Bordeaux, A River Cruise Destination? Though rarely considered by those choosing regions to river cruise, Bordeaux is like no other river cruise destination. It’s one of the few destinations where river cruisers and ocean cruisers can access the city. I’ve visited Bordeaux on Silversea Cruises and on river cruisers operated by AmaWaterways, CroisiEurope and Viking River Cruises. Access to the Atlantic for ocean cruisers is through the Gironde estuary, and in fact, river cruisers also transit the estuary along with the Garonne and Dordogne rivers. A tidal phenomena called the Mascaret gives Bordeaux another distinction. The Mascaret is a tidal bore that creates waves powerful enough for surfing. River cruise ships must take precautions to avoid the brunt of these tidal fluctuations, which also dictate timetables and itineraries. The city of Bordeaux serves as a hub for river cruises, with the destinations spoked out along the estuary and the two rivers. In Bordeaux, river cruisers tie up along the long and slightly curving promenade that borders the Garonne river. Bordeaux is built on a bend of the river and divided into two parts: the right bank to the east and left bank in the west. The French poet and novelist Victor Hugo is said to have found Bordeaux to be so intriguing that he said: “Take Versailles, add Antwerp, and you have Bordeaux.” Take time to stroll or cycle along the left bank and to enjoy Bordeaux’s beautiful architecture such as Place de la Bourse with the Miroir d’eau. In April of 2016, I spent seven nights on AmaDolce, operated by AmaWaterways. 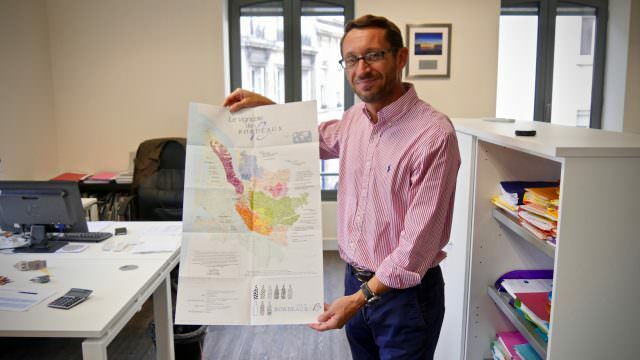 The company’s “Taste of Bordeaux” itinerary basically offers wine tours via boat and bike – or hike. 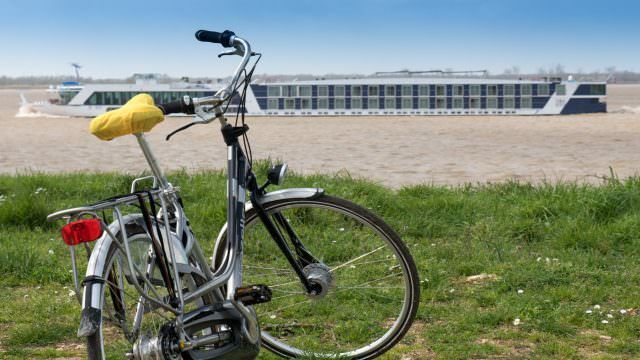 AmaWaterways strives to be the most active of all river cruise companies, hence the emphasis on bikes and hikes. Don’t worry. If active tours aren’t your thing, you’re well covered. A fleet of buses and slower walking tours will show you all that you need to see in the Bordeaux region. AmaDolce carries a fleet of bicycles that we could use on a complimentary basis for independent and/or guided tours. We pedaled four days out of the seven we were on board. It’s hard to imagine a better way of exploring the wine-producing region surrounding Bordeaux. Built in 2009, AmaDolce features 71 staterooms, along with wonderful meals and regional wines, poured free of charge during lunch and dinner. We enjoyed entertaining lectures and socializing in the lounge before cozying up in our staterooms to sleep away the night. On some days, we relaxed during stretches of scenic cruising. Along with the Seine and the Rhône/Saône, AmaWaterways’ Bordeaux river cruises offer truly immersive experiences. I thoroughly enjoyed exploring this beautiful part of France and its bountiful vineyards. AmaWaterways offers “A Taste Of Bordeaux,” a land/cruise combination that spans 13 days, with two nights in Paris, followed by a seven-night cruise roundtrip from Bordeaux, then two nights in the Loire Valley and one final night in Paris. Tissinier works with AmaWaterways to develop and operate excursions. 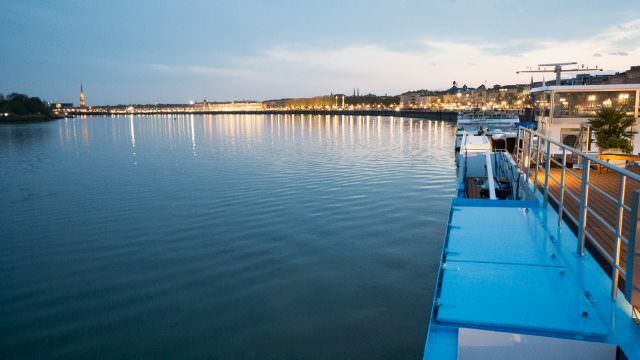 River cruises begin in the city of Bordeaux, where AmaDolce docks along the waterfront, overnighting and departing the following morning to visit a handful of ports of call during the next several days. 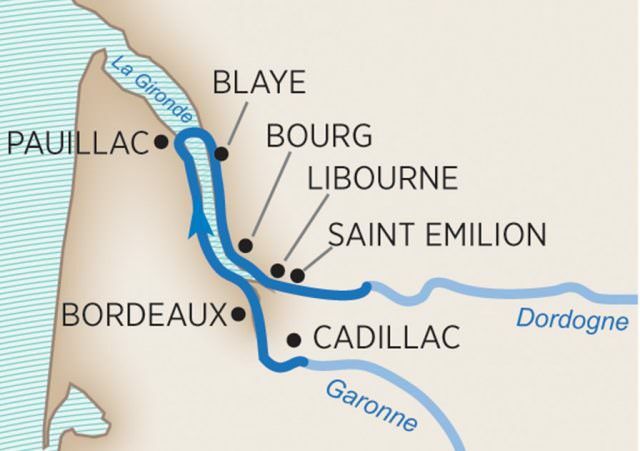 After leaving Bordeaux, AmaDolce departs for Cadillac (pronounced Caddy-yak), situated on the Garonne river across from Sauternes. The ship docks within walking distance of the commune, the name of which was adopted by the French explorer, Antoine Laumet de La Mothe, sieur de Cadillac, founder of Detroit, Michigan. As you might assume, General Motors named its Cadillac division after the explorer. Cadillac and the surrounding region is renowned for its white wines, including the sweet wines of the Sauternes wine region, which you’ll taste on an included excursion. 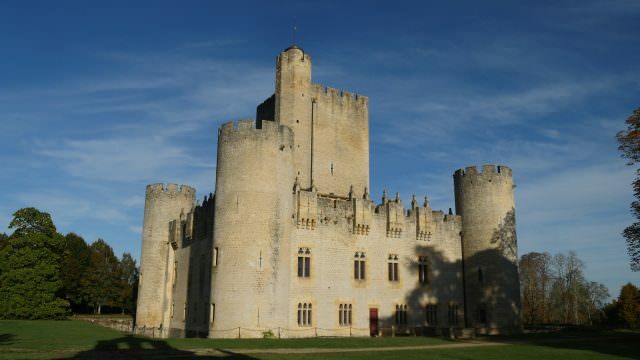 After the wine-tasting, visit the historic Roquetaillade Castle, centuries old and almost perfectly preserved. The castle excursion includes guided tours around the grounds and inside the castle. The next day, AmaDolce visits Pauillac, a lovely village on the Left Bank of the Gironde estuary. Situated in the very heart of the famed Médoc AOC (appellation d’origine contrôlée, a government controlled destination of origin which signifies where grapes are grown), Pauillac’s gravelly soils are renowned for producing some of the world’s finest Bordeaux wines – especially those made from the Cabernet Sauvignon and Merlot grape varietals. You’ll be able to taste local at an authentic Grand Cru Classé wine tasting and also have free time to explore Pauillac. AmaDolce docks here overnight. “When we are early, thanks to the tides, we arrange hiking from the pier with three levels of activities,” Tissinier says. There’s a five-kilometer hike to a nearby village situated in the middle of a vineyard. An eight-kilometer hike leads to Château Mouton Rothschild, home to one of the world’s greatest clarets. AmaWaterways tends to visit only ACO-designated vineyards, Tissinier says. The next day AmaDolce visits Blaye, on the other side of the Gironde estuary. North of Bordeaux, Blaye is best known for its red wine and historic military significance. Two excursions are offered: a guided tour of the city’s 17th century citadel. The UNESCO World Heritage Site was built by the famous military engineer Vauban. From the top of the fortress are fantastic views of the Gironde estuary. Or you can join a guided bike tour. I did this and loved it. We pedaled on small roads and through vineyards, admiring the gorgeous châteaux, the river and crossing Santiago’s path, a pilgrimage route from the middle ages. The 17-kilometer bike tour took us along the “Captain’s Road,” a scenic coastal path that leads to Bourg sur Gironde. While we were pedaling, the ship made its way to Bourg. Situated at the confluence of the Dordogne and Garonne, Bourg was built during Roman times and later fortified by the English. AmaWaterways features an exclusive festival of music and wine from the appellation of Cotes du Bourg. The venue is “on a high terrace overlooking the city,” Tissinier says. “You have a chance to meet the local people while tasting the local wine and food.” AmaDolce docks overnight in Bourg. The next day brings you to Libourne, with a stone’s throw (a grape’s throw?) of two of Bordeaux’s most elite wine regions – Saint-Émilion and Pomerol. 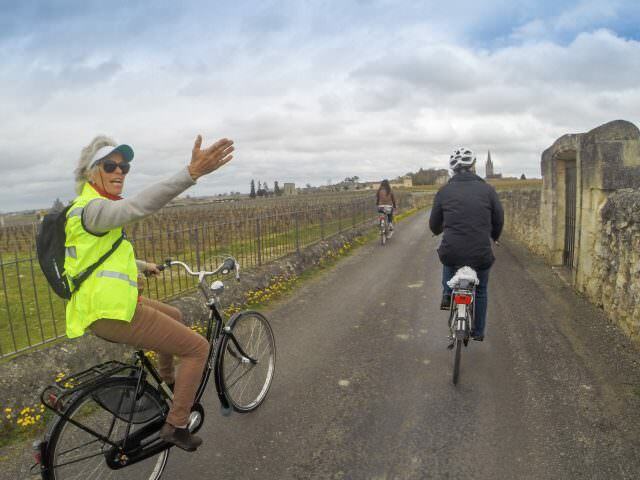 Again, I joined a guided bike tour, this one from Libourne to Saint-Émilion, through the Pomerol region. In Saint-Émilion, we enjoyed a Grand Cru Classé wine tasting, with no worries around pedaling back to the ship. Our bikes were loaded on the motorcoach and transported back. You’ll also have 30 minutes to 45 minutes to explore tiny Saint-Émilion. The other excursion included a Grand Cru Classé wine tasting and a visit to the Underground Churches, a UNESCO World Heritage Site, in Saint-Émilion, as well as a panoramic tour of Pomerol. Because Saint-Émilion is quite hilly and with cobblestone streets, AmaWaterways offers a “gentle walkers” tour that includes what Tissinier calls “a smooth discovery of the village” on a tourist train. The train ends the tour at the wine chateau for the tasting. AmaDolce remains overnight in Libourne. The next morning we had the option to start our adventure with a tour of the magnificent Château Vayres, located on the banks of the Dordogne River. As an alternative we could visit a well-preserved local bastide town, which was fortified during medieval times. We visited Créon, where the market was lively and colorful. In the afternoon we had the option of a Fronsac wine tasting, or a visit to Château de Montaigne, a stunning 14th century castle that was the family residence of the philosopher, Michel de Montaigne. The same family has been living in the chateau for six centuries. We sailed back to Bordeaux and docked alongside for a beautiful evening. Still one more day, day seven of our eight-day “Taste of Bordeaux” river cruise. We had the option to discover Bordeaux by bike or by walking tours. The capital of the wine world is a UNESCO World Heritage Site and, with more than 360 historic monuments within its borders. Bordeaux is also classified as a “City of Art and History.” We had the opportunity to experience much of the rich culture and architecture here, including a tasting at the Wine Museum. Among the sites we saw: the Pont de Pierre Bridge, Quinconces Monumental Square and the famed water mirror, Mirroir d’eau. AmaDolce overnighted in Bordeaux, and we disembarked the next morning for our flights home or further exploration. It was the perfect way to end a cruise in a region renowned for its wine. The only thing that would make it better is if we could get behind those doors guarding the Fort Knox of wine. 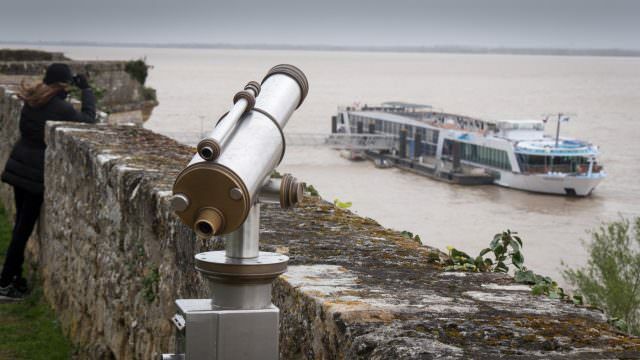 2017 rates for AmaWaterways’ A Taste of Bordeaux river cruises range from a November 9 departure priced at $2,099 cruise-only (eight days) to $5,619 for the full 13-day trip. Per diems work out to $262 per person to $432 per person, depending on the season. For more information, visit Taste of Bordeaux River Cruises.